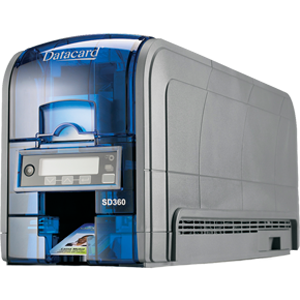 Entrust Datacard SD360 ID Card printer SD Series printers are a great value, with competitive pricing and innovative features. The SD360 card printer produces outstanding, dual-sided ID cards that are both visually impressive and easy to produce. Print more cards in less time. SD Series printers are significantly faster than any other desktop card printers in their class. And TruePick™ anti-jam card handling accurately picks cards, standard and thin, with no adjustments. Standard, built-in Ethernet and USB ports, and the browser-based Printer Manager, help you integrate SD Series printers into just about any application or IT environment.